Legends born and die with the passing of age and time. Some are remembered and their legends are passed down from generation to generation. Others are buried with the last who lived to see it. The sands of time slowly subsiding it into myth and lore. What becomes of a legend after they go? What roads and paths did they travel to forge the greatness and durability of such a reputation? There is a lot to be said for a pack to last beyond the ages. Beyond that of their ancestors, those who could have never imagined its greatness or failure. To have a leader ready at the helm, to take charge and guide their family to unimaginable heights and journeys. A pack, long thought to be extinct many ages ago, still thrives by the blood that persists to beat within that great leader of its time. A leader that has the undying loyalty and love to carry on a name that has done so much in its past. But what of the future? The packs history laden with great stories of adventure, death and rebirth. This is one of those stories. The canvas of nature is spread as far as the eye can see and invites all wary travelers lone or not to come and tred within the territory of a Legendary pack. What adventure do you seek? What will you find? Family? Hope? Renewal of spirit? Is this your calling? Perhaps you will find it here, perhaps not. May you find peace from the past and solace for the future, for it is such a paradise rarely found anywhere else. Only the chosen may remain. Perhaps your calling will take you home. We welcome all for we do not divide.. but rather we unite. In Spirit… we are free. WolfSpirits is currently the oldest RPG pack’s on mIRC. We’ve been running strong for 15 years. WolfSpirits is a free form semi-realistic wolf role play pack. It was founded by Kovo & Spirit February 25, 2002. We role play on mIRC ( or IRC ) on the server irc.sorcery.net. Our channels are #WolfSpirits for In Character and #WS_OOC for out of character. 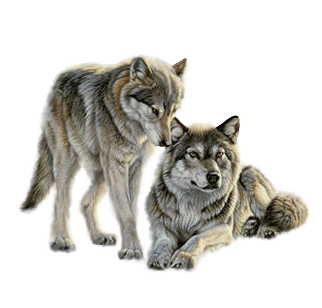 WolfSpirits is a pack that has survived so long because of the dedicated and loyal members that it has the privilege of having. We surely wouldn’t be who we are now and today if it wasn’t for those who’ve come, those who’ve gone and those who continue to stay.